Here’s the TEDx San Francisco talk I gave on October 29th 2015. I call it “Stories of the Future,” though the TEDx site shows it as “Make it Bigger,” by which I meant our conception of the problem. And if you prefer old media — like reading a website — the script is below. It’s often said that the 20th Century began, not in 1900, but in 1914, with the assassination of Archduke Ferdinand and the subsequent outbreak of World War I. This raises a question about the 21st Century — has it begun yet? I think it has, though it’s hard to mark its exact beginning. To do so, you need a storyline. A story of the future. If you want a dystopian story, it’s easy to date its beginning. Just use September 11, 2001. But what if you want to tell a helpful story? One in which we actually deal with our greatest problems. A believable story in which the historians of the future look back to our time, today, as a time of new beginnings. What date, exactly, would mark these beginnings? Let me suggest two possible dates, marking two very different storylines, which are fated to play out together. The first comes soon, in December, at the Climate Conference in Paris. Now there’s a lot to say about Paris, but let me just follow climate big think tradition and quote Winston Churchill. Paris, if we’re lucky, will mark the “end of the beginning” of the climate mobilization, the point when all countries make emissions-reduction pledges that they’re willing to defend as being both ambitious and fair. It won’t be enough, but when you think about it, it might be a pretty good place to start serious negotiations. The second marks a very different kind of event. It occurred in February of 2011, when a computer system named Watson defeated the reigning human champions in the unstructured language game of “Jeopardy.” Now I willingly admit that Watson’s victory is an arbitrary kind of marker – especially compared to Paris – but it’s about as good a marker as we’re likely to find for the deep challenge of computerization. 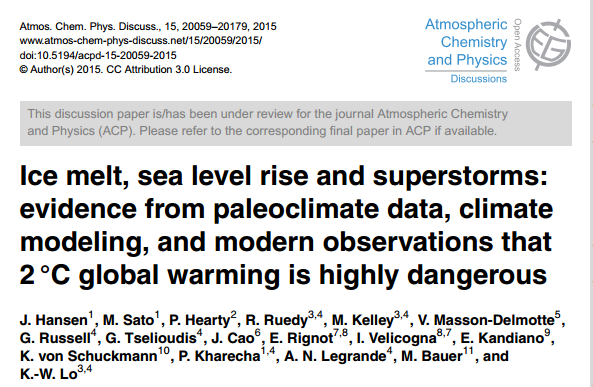 And let’s start with climate science, which is marching into ever darker territories. I’ll cite exactly one paper. 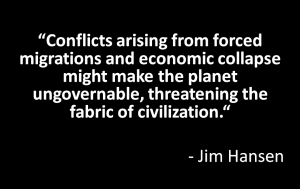 Jim Hansen is its lead author, and it suggests that the old view of the climate danger might just be a wee bit optimistic. 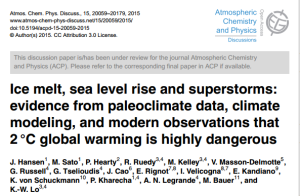 That, in fact, a warming of 2 degrees C should not be seen as a “guard rail,” placed to keep us on a “safe” pathway, but rather as a last line of defense, a line that must not at any cost be breached. 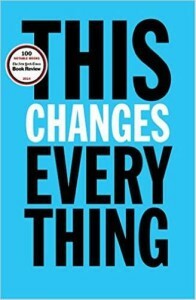 What everybody does not know is what we’re going to have to do about it. Which is to manage the inevitable. 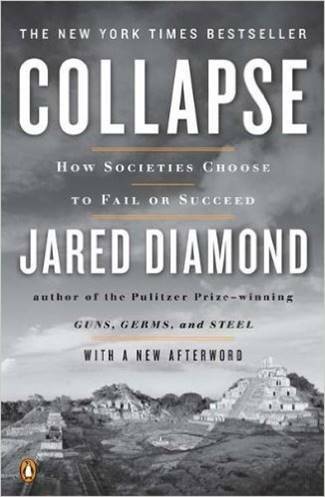 And, the inevitable – if we’re going to stabilize the climate system – includes a global pathway in which we draw greenhouse-gas emissions down, more or less to zero, and as quickly as humanly possible. Down to zero, globally, in fifty years. Give or take. No it would not. Which brings me to the second part of my story, technological revolution. But even though I began with Watson, I’m not going to loop straight back to computers. I’m going to jump to New Energy – solar and wind and next-generation batteries and smart grids and all the rest of it. All of which are rapidly maturing. 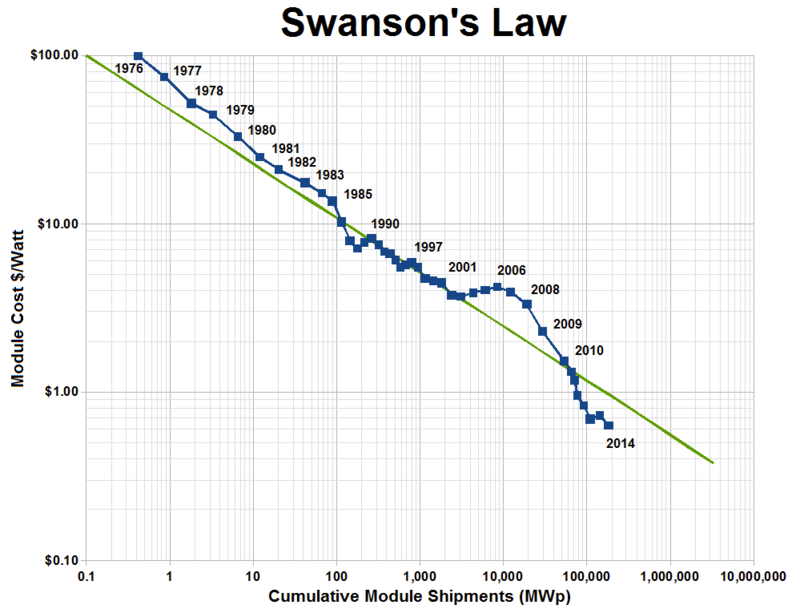 There’s an excellent example of this happy trend: the falling cost of solar panels. 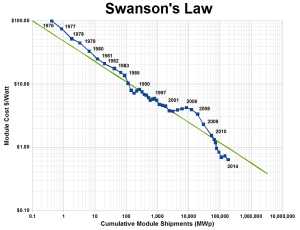 There’s even a “law” named after this falling cost – Swanson’s Law – which may in the end be at least as important as Moore’s Law. In fact, the cost of solar PV has fallen so low that new solar generating capacity is already cheaper than new coal capacity. Again, the technology we need is coming along nicely. But there’s a twist. Even though the story of the 21st Century is going to have everything to do with technology, it is not fundamentally a story about technology. Rather, it’s about coming up with a political transition in which we empower ourselves to use technology effectively. In which we maximize its catalytic power. In which we stop waiting for technology to save us and admit that, while the tech revolution absolutely makes it possible for us to save ourselves, we still have to do so. You know this nightmare. Frankenstein. Nuclear war. 1984’s video-cams. Killer robots. Implacable machines in general. And, ultimately, human obsolescence. This is the old shadow, in its many forms. But it faded with the “personal computer revolution,” which wound up telling an entirely different story: A rush of cheap, complex devices. Floods of money. Boundless optimism. Technological reductionism and technological cool. The framing here fully crystalized during the early WIRED years, and of course it hasn’t passed. My claim is that overblown tech optimism is long past its prime. The worry has returned; it’s thick in the air and it’s not going away anytime soon. 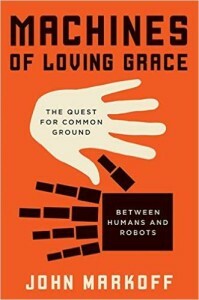 New York Times writer John Markoff, in his book Machines of Loving Grace, is useful here, for he tells the story of computerization as the story of a debate. A long debate between the AI people – who dream of artificial intelligence — and the IA people, who dream of intelligence augmentation, of machines as multipliers of human intelligence. Markoff’s point, a crucial one, is that there’s more than one possible high-tech future. That we get to choose. And that we had better choose well. The outcome is not predictable, but one thing is certain – we had best maintain a sense of proportion. For example, machines are not becoming intelligent. But they are, definitely, becoming more capable. And this is absolutely going to be a century in which the mechanical systemization of complex economic processes far surpasses the old limits. Think about work. And jobs. And wages. And unemployment. Think carefully about global unemployment. Think about Amazon-style high-automation distribution centers, and about the flexible automated factories that will be arriving soon. Think about automated writing systems, and automated legal research. Think about the automation of analytics, and thinkwork in general. This is where Watson comes in – not as a PR prop, but as a suite of technologies that only continues to improve. Put all this together and add integrated global supply chains. And poorly-regulated international trade regimes. And the new class system, now hardening into a caste system. And all of this on a world drifting into climate crisis. You’ll see shadows, for sure, and choices everywhere. 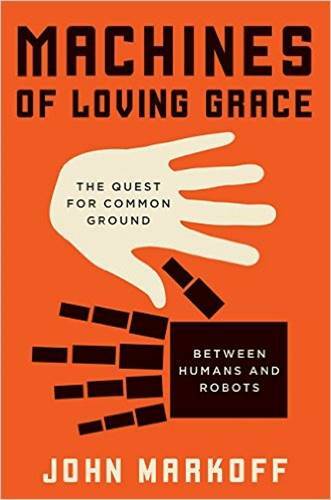 The new automation suggests a future in which “jobs” no longer allocate access to daily life and daily dignity in anything like an acceptable manner. Fair access to education, housing, culture, social stability, hope – this is a fading dream. And then there are the worlds of energy and climate, where large scale distributional flashpoints are everywhere. * Think to all the trillions of dollars worth of coal, and oil, and gas that can never be burned. Not unless we intend to entirely deglaciate the planet. And think to the scale of the challenge here. Keeping the “unburnable carbon” in the ground is going to mean economic disruption on a grand scale. There are going to be big winners and big losers. * Think to the Paris climate treaty, which can only succeed if it lays down a “fair shares” path by which the wealthy and the poor work together to quickly and cooperatively phase out fossils, and phase in renewables. This is anything but a simple technology problem – which is why the climate treaty may, in the end, be the largest economic treaty of all time. * Think to the export-driven, manufacturing-led development paths by which low-skill countries like China began their climb out of poverty, and think to all the strivers – India, Vietnam, dozens of others – that still hope to follow in China’s footsteps. And consider what it would mean if new automation systems closed off their paths. The dream of the climate movement is one in which clean-technology combines with “equitable access” to yield a world of sustainable prosperity for all. But given the challenges of the coming century, what will it take to make such a dream believable? It’s because the shape of the reckoning is now widely visible. 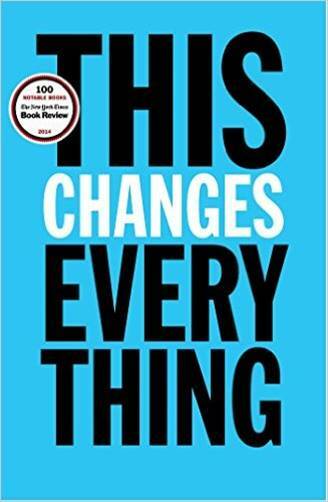 Naomi Klein argues, in her book This Changes Everything, that the climate crisis presents us with a powerful new way of thinking big. That it in fact forces us to do so. My argument, a closely related one, is that the climate crisis, narrowly conceived, is not a big enough problem to solve. 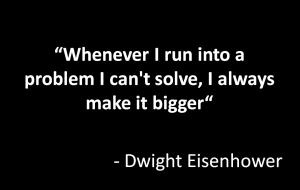 This is sometimes called the Eisenhower Principle, and it sure seem to me to deserve more attention. Because in a time of big history, thinking small is a recipe for disaster. This is why I’ve tried to bring the story of the Second Machine Age into the story of the Greenhouse Century. Automation brings big history into individual lives in a way that makes it understandable. Work is personal. So is unemployment and underemployment. So too are drought and extreme storms. So too, by extension, is the larger storyline. Sometime in 2016, an amazing event is going to take place. For the first time in modern history, the richest 1% of the global population will own as much as the other 99%. Seriously, you can graph it. Oxfam already has. Because, as anthropologist Jared Diamond warned in his 2005 classic, Collapse, the societies in which decision-making elites are able to retreat behind protective barricades, and to insulate themselves from the sufferings of the larger population, are exactly the societies that do not adapt to pressing circumstances. 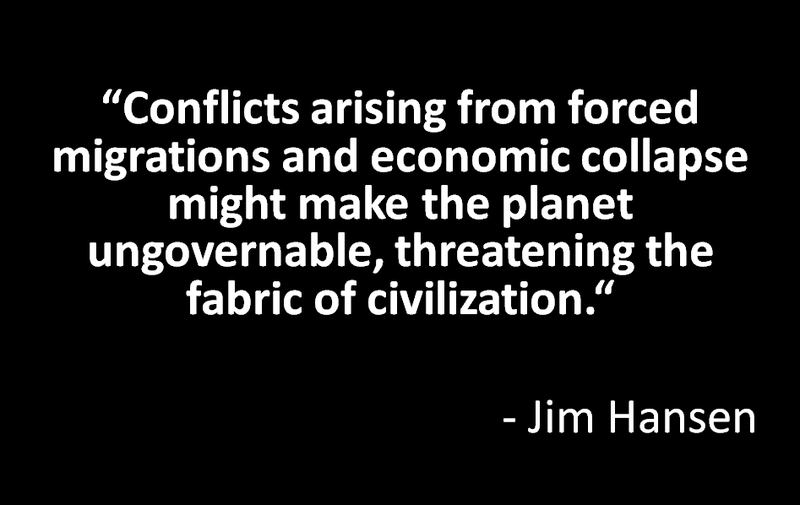 The climate problem, properly considered, IS big enough to solve. First, by admitting – along with the Pope – that economic injustice and climate catastrophe are two sides of one coin. Second, by realizing that the best ways forward are those that address both sides of the problem at the same time. Ways that depolarize the economic divide even as they lay the ground for a rapid climate transition. There are lots of good ideas for how to do this. Thousands of ideas. Green jobs and green Infrastructure. The Basic Guaranteed income. Cap and Dividend. Strong social and environmental rules at all levels of the economy. The deliberate choice to make high-technology work for all, and not just for the lucky few. A universal climate treaty that’s explicitly designed to lift up the poor. 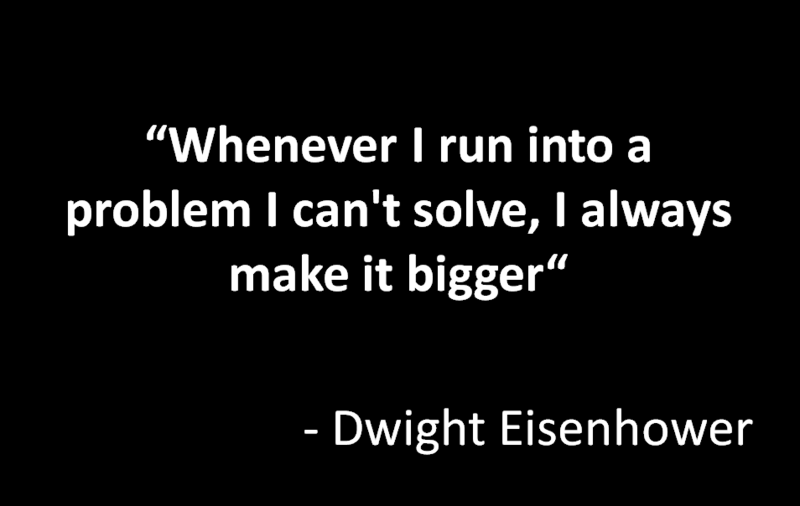 The list is long, but the point is simple: we have to think big, and we have to do it now. Because whatever else happens or doesn’t happen, we haven’t got a hope of stabilizing the climate unless we rapidly shift trillions of dollars a year from fossils to renewables. And this isn’t going to happen by itself. We can do this. We have the tools. One of these days, we’ll face the enormity of the stakes. That will really be a day to remember.